It’s a great time to be alive. Very soon we civilians will have the opportunity to go to space. Of course at first it will cost a pretty penny to do so, but in time the price will drop and make it more accessible to all of us. This week Scaled Composites successfully completed a cold-flow test of its rocket nozzle on SpaceshipTwo over the Mojave desert. This test proved the flow-path of rocket fuel and is another step in the process of getting SpaceshipTwo ready for powered flight tests. For those that do not know about SpaceshipTwo, its all really awesome. Spaceship Two will be flown to a height of roughly 50,000ft where it will be released from the “mothership” WhiteKnightTwo. 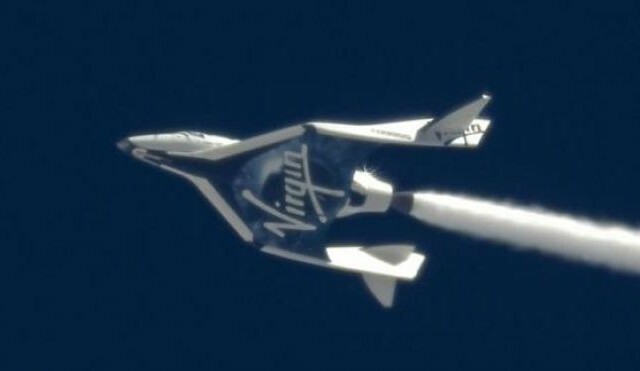 Once dropped SpaceshipTwo will ignite its rocket engine and blast into sub-orbital space. Peak altitude will be about 68miles above the Earth’s surface where passengers will get to experience about 5minutes of weightlessness. Smart Martian Maniacs will note that just because you’re weightless, doesn’t mean you don’t have MASS! Perhaps coolest; Passengers will officially be “astronauts” when they pass the 62mile mark. RAD! Passengers will also get to travel at roughly 2500 mph, or over three times the speed of sound. How cool is that?!?! All of this madness is being operated by Virgin Galactic and flights to space are currently priced at $200k. So when you slap down the mega-bucks ($$$) to become and astronaut and take that space flight be sure to crank Deserts of Mars in your headphones as you make history and leave the bounds of this earth. For each step we take is one more step towards an epic rock concert on Mars and that is damn cool. Perhaps most importantly, this flight will change your life by changing your perspective on life. Seeing earth from space will give you a new perspective on how fragile life is, how we are all connected, and how awesome a rock concert on Mars will be! Richard Branson has a nice post on this topic dubbed “The Overview Effect” with a link to a cool video on his blog.